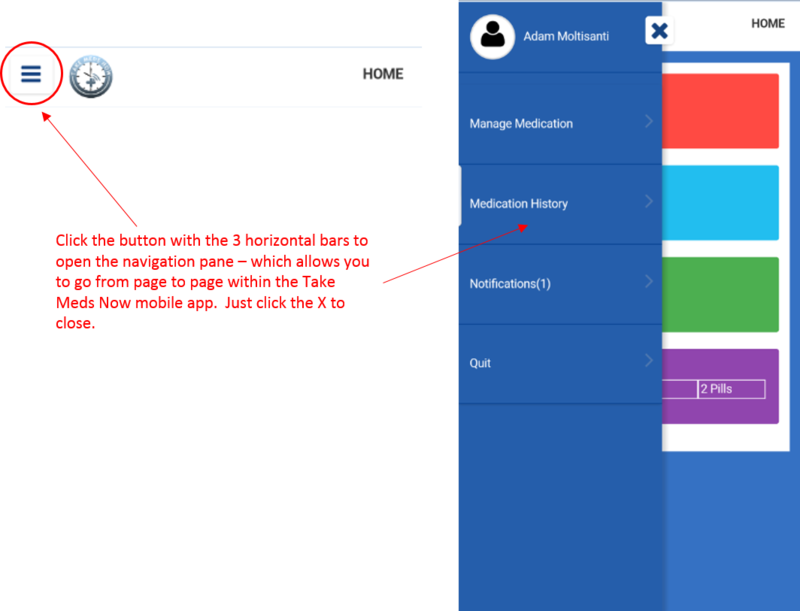 Below you will find individual walkthroughs of the various pages/sections of the Take Meds Now application. By clicking on any of the below titles, you can learn how to take full advantage of the various features made available to you. 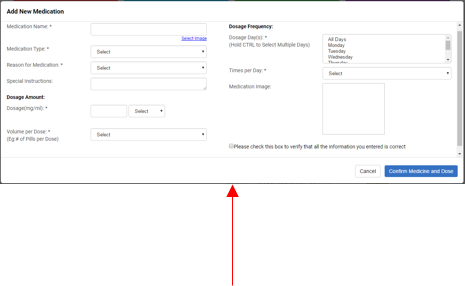 Just click the page/section title to open or close a walkthrough, which have been categorized based on the feature sets and pages you will see when signing into your Take Meds Now account. If you have a question or issue that is not addressed in one of the below sections, please see our FAQ. In order to log into the Take Meds Now application, open any web browser (Google Chrome, Mozilla Firefox, Microsoft Internet Explorer, etc.) and type www.takemedsnow.com. Once on the Take Meds Now homepage, click Login at the top righthand corner of the screen to access the web application. Alternatively, you can open any browser and type portal.takemedsnow.com, which will take you directly to the web application. Remember, you can always bookmark the website and/or the web application URL to create a quick link in your browser bookmarks bar. Now, just enter in the email address you used when signing up for the service and the password you created, and click the “Login” button to access the application. On your tablet or smartphone, go to wherever you download/purchase other apps. For Apple users, this may be the App Store; and for Android users this may be the Play Store. Once in this app, search for “Take Meds Now” in the search bar (you may have to click an icon of a magnifying glass to open the search bar, and click inside the search bar to bring up your keyboard). Once you have found the Take Meds Now app, click Download and/or Install to download it to your tablet or smartphone. After the app has been downloaded, find it on your device (tablet or smartphone) and click on the icon of our logo to open. This will open the login screen on your mobile device. Now, just enter in the email address you used when signing up for the service and the password you created, and click the “Login” button to access the application. In the event that you forget your Take Meds Now password, head to the login page for Take Meds Now (www.takemedsnow.com/login) and click “Forgot Password.” Just follow the on-screen prompts to enter your email address and reset your password so you can regain access to your Take Meds Now account. 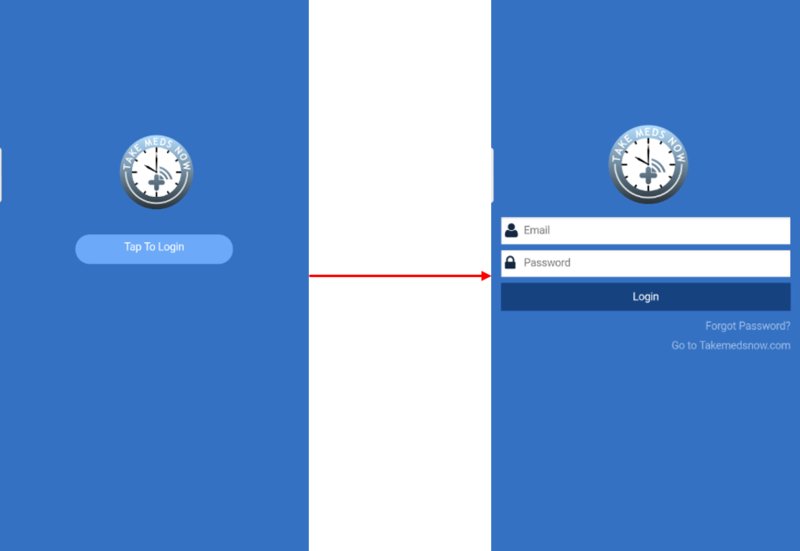 In the event that you forget your Take Meds Now password, open the Take Meds Now app and click “Forgot Password.” Just follow the on-screen prompts to enter your email address and click submit. This will trigger an email to your email account with a link where you can enter in your new password. 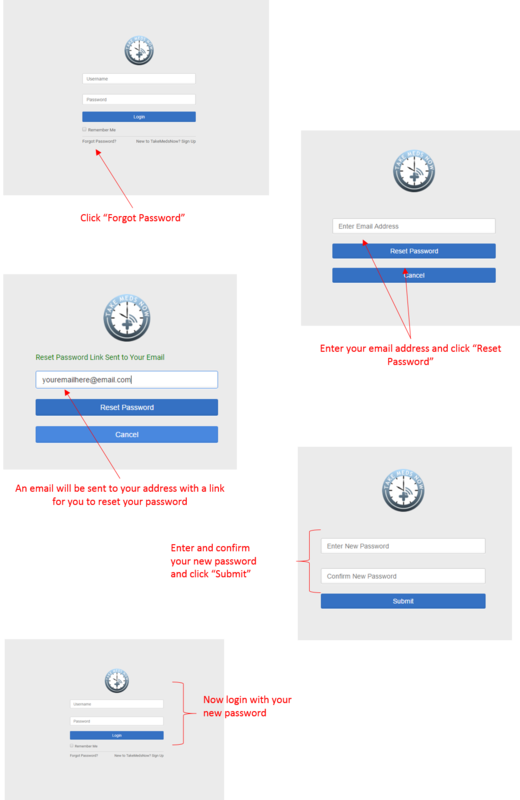 Once entered, you can return to the login screen and use your new login credentials to access your account. The “Adherence” column will populate as you either acknowledge or miss the automated medication alerts. After a dose is either acknowledged or missed, the status can be changed in the Medication History page (please see the below section for the Medication History page to learn more). The “Yesterday’s Medications” table will show the medications you needed to take yesterday, including the “Adherence” column. 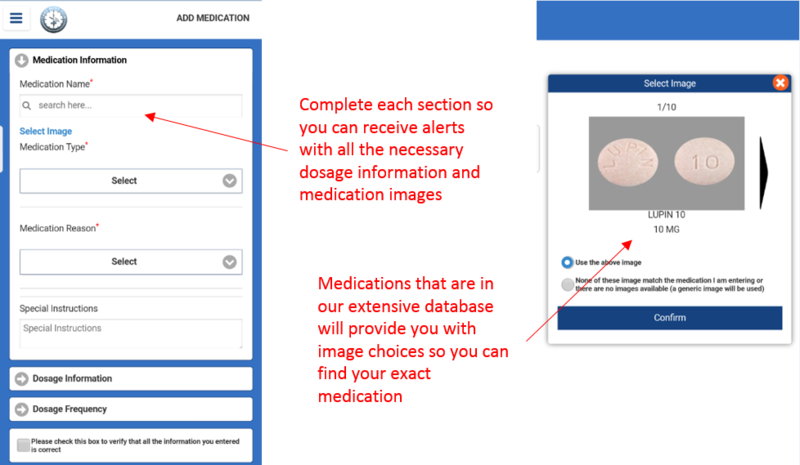 The Adherence column will be populated based on whether you acknowledged or missed the automated medication alerts as they appeared for each dose. The status of these doses can also be changed in the Medication History page. The mobile app for Take Meds Now provides you with a quick-view dashboard so you know exactly what your next dose of medication(s) will be. 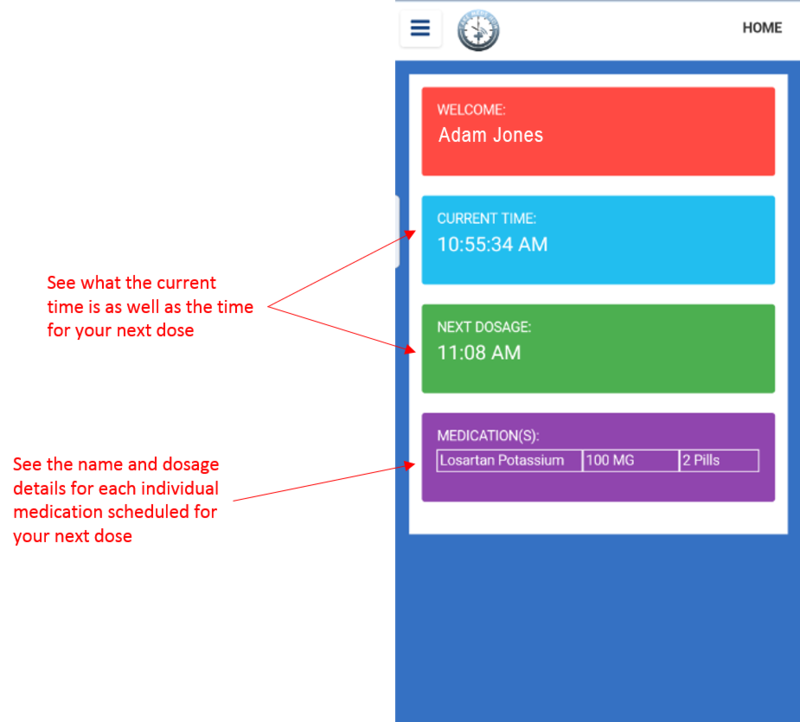 The dashboard contains the time of your next dose and the exact medicine(s), complete with the dosage details for each individual medication. In order to navigate to the various screens of your Take Meds Now account, use the in-app navigation slider. Take Meds Now enables you to enter and manage any of your prescription or over the counter (OTC) medications. The initial section of the Manage Medications screen is the Medications Table. 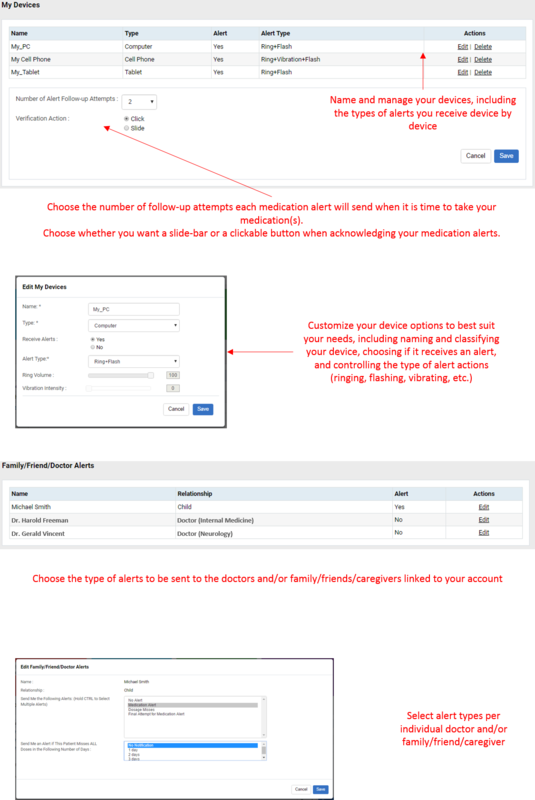 This contains any medication that you have entered into the system, and displays the medication name, dosage, frequency, dosage time, reason for taking the medication, and a thumbnail image of the medication (which you can click on to enlarge and view in more detail). You can also add, edit, or inactivate a medication. By “Inactivating” a medication, you remove this medication from your active rotation, meaning you will not see medication alerts for this medication. At any time, you can click the “Show Inactive” button above the table to see any medication you have taken in the past – which you can then “reactivate” in order to start receiving medication alerts. If the medication you have entered exists in our database, we will provide an image that may match your medication. If the medication is not in our database, you will be presented with a generic image based on your medication type selection (pill, liquid, etc.). Please note that this image may not be an exact representation of the medication you are taking. You will need to acknowledge that all the information you have entered is correct before saving, so please re-read all the information you input carefully and make sure there are no errors. 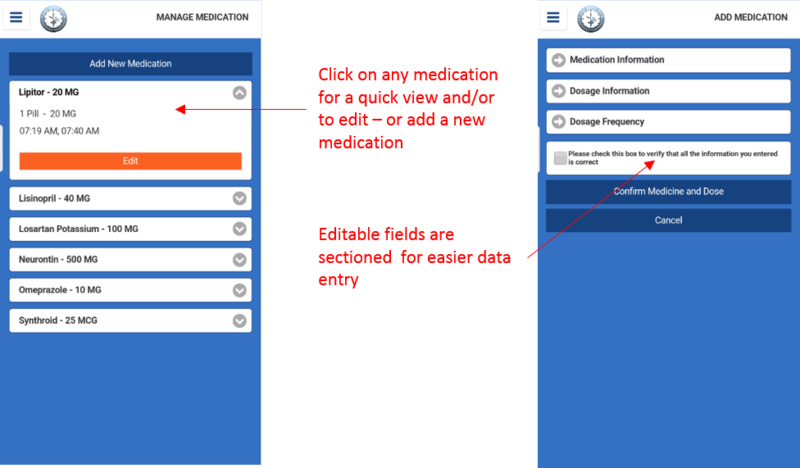 You can also add or edit your medications through the Take Meds Now mobile app. Select the Manage Medications option from the navigation, where you will be able to view the entire list of medications associated with your Take Meds Now account. 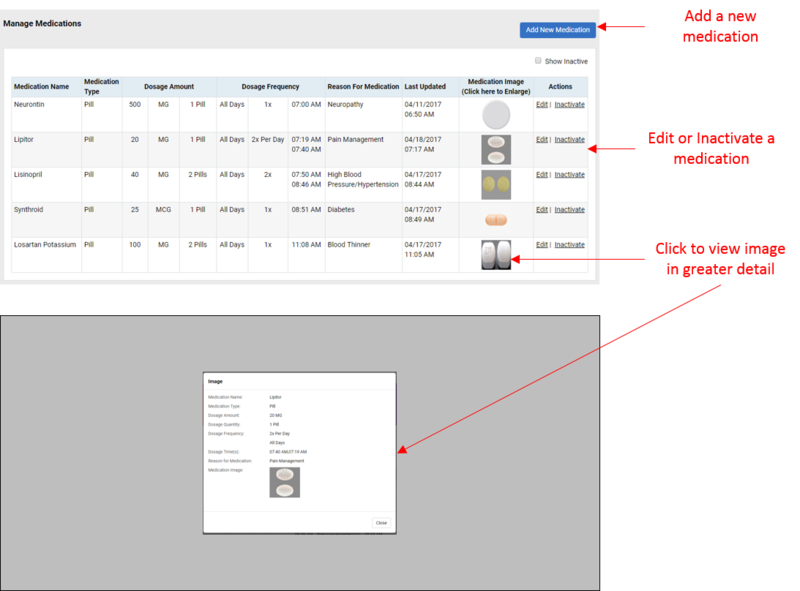 You are able to open each existing medication to view a quick set of details and/or edit the entry. You can also select “Add New Medication” to add a new medication to your Take Meds Now account. All of the medication fields are broken up into smaller sections that can be opened and closed. As you type in the name of a medication that currently resides in our database, you can select it from the automatic suggestions that appear as you type, and you will be able to select a medication image associated with that drug. If it is not in our database, you will be provided with a generic image based upon the type of medication you are entering. As soon as all of the fields are complete and you save your new/edited medication, you will start receiving alerts as per your settings. 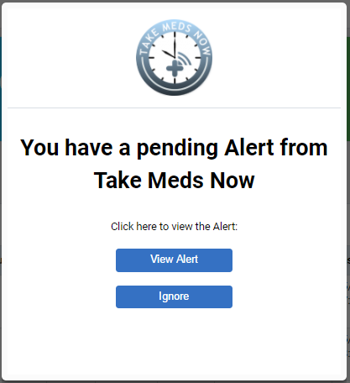 When you receive an alert from Take Meds Now, you will see a cover page indicating that you have a pending message from Take Meds Now. 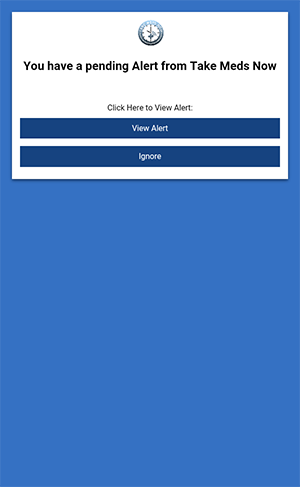 On this cover page, you have the options to “View Alert” or “Ignore.” Clicking “View Alert” will show you the pending alert, which then can be acknowledged by clicking or sliding the verify button. Clicking “Ignore” will dismiss the alert. *It is important to note that clicking “Ignore” may result in a medication alert being recorded as a miss. If you click “Ignore” on an alert, and as per your settings you have additional follow-up attempts remaining for that alert, you will receive the remaining attempts. If you click “Ignore” on the final attempt, it will be recorded as a miss. As you acknowledge or miss the automated medication alerts sent to you by Take Meds Now, a comprehensive history of your medication adherence is built. 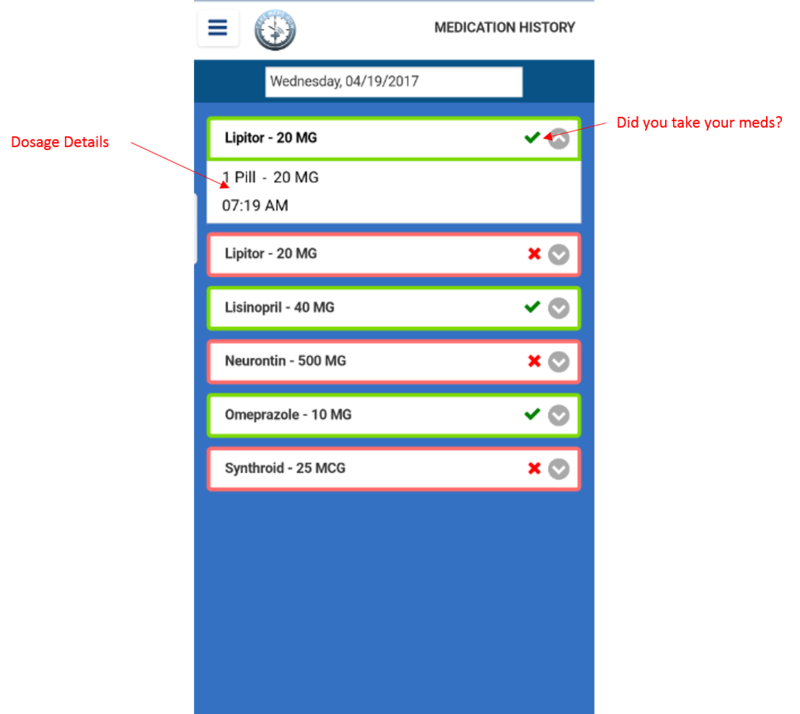 By navigating to the Medication History page, you are able to see exactly what medications you took or missed at what times. On this page, you can select the dates you wish to view by entering them in the “Filters” section and clicking the button to generate the report. This will show you a day by day, medication by medication report that allows you to pinpoint any medication dosage to see if you took it or missed it. The report table includes the medication name, dosage, frequency, time, reason for taking the medication, and adherence grouped by day and time. You can then change the status for that dose, either from taken to missed or missed to taken, in the event that you didn’t have the opportunity to or incorrectly acknowledged the medication alert. This feature will ensure that you never accidentally double up on a dose; and allows you to identify any trends in your medication adherence. As you acknowledge or miss the automated medication alerts sent to you by Take Meds Now, a comprehensive history of your medication adherence is built. By navigating to the Medication History page, you are able to see exactly what medications you took or missed at what times. 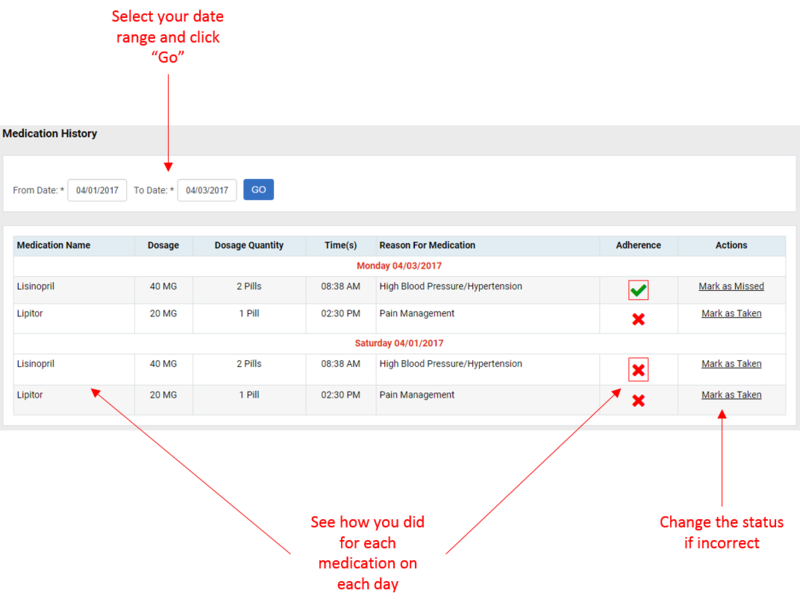 On this page, you can select the date you wish to view by clicking on the calendar field and selecting the date you wish to see. This will show you exactly what medications you took or missed for that day. 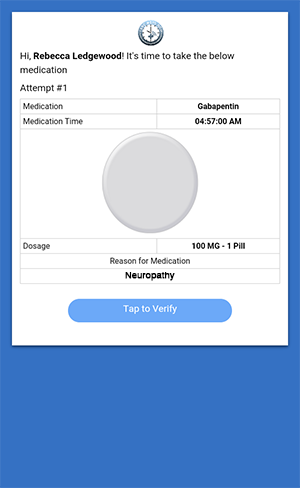 In the Take Meds Now mobile app, you are able to view the status and dosage details on a medication by medication basis. Just select the down arrow to open a specific medication to see the dosage details. The page displays a quick view for the entire list of medications for the selected day, which both has a dosage indicator (check mark, x, etc.) and is color coded so you can quickly assess how you performed that day. Take Meds Now allows for your doctor to send you in-system messages, which keeps you connected to your doctor like never before. 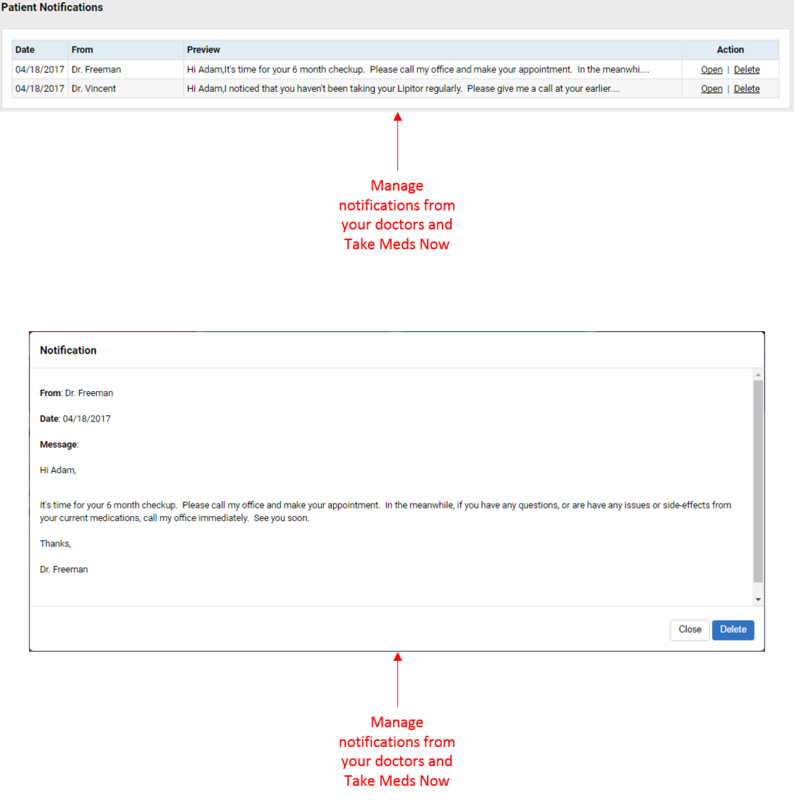 New messages, or notifications as they are referred to in-system, will appear when you first sign into the application. After acknowledging a new notification, it lives in the Notifications page. Here, you will see a table containing all of your notifications as sent by either your doctor(s) or the Take Meds Now team. The table will provide you with a preview of the message, who sent it, and the date it was sent – and you can either Open the message to read in full or Delete to remove it from your account via the Actions column. Please note that any notification that is Deleted will be permanently removed from your account and will no longer be accessible. 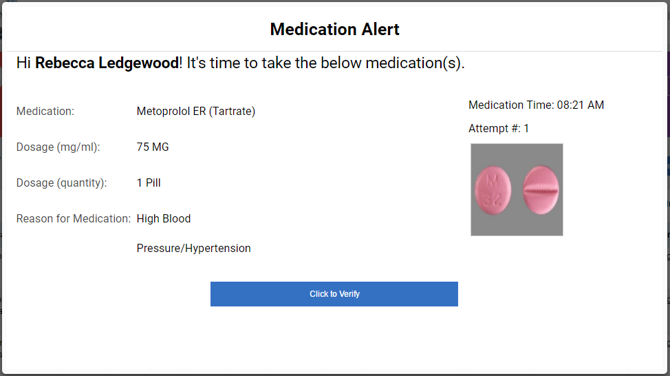 Take Meds Now allows for your doctor to send you in-system messages, New messages, or notifications as they are referred to in-system, will appear when you first sign into the application on your tablet or smartphone. After acknowledging a new notification, it lives in the Notifications page. Here, you will see a table containing all of your notifications as sent by either your doctor(s) or the Take Meds Now team. The table will provide you with a preview of the message, who sent it, and the date it was sent – and you can either Open the message to read in full or Delete to remove it from your account via the Actions column. Please note that any notification that is Deleted will be permanently removed from your account and will no longer be accessible. View Only – this type of user access can be given to family, friends, or caregivers, and offers them the ability to view your medication history and make sure that you are properly taking your medications. Administrative – this type of user access can be given to 2 family or friends, and offers them the ability to manage your medications, receive medication alerts, and modify your medication adherence history. This allows you to link your account with your loved ones so they can help make sure that you take your medications properly; and even assist you with the management of your account if desired. You can also link to your doctors through your Take Meds Now profile. Just search for a doctor, select them, and Take Meds Now will send an invitation to link to your account. 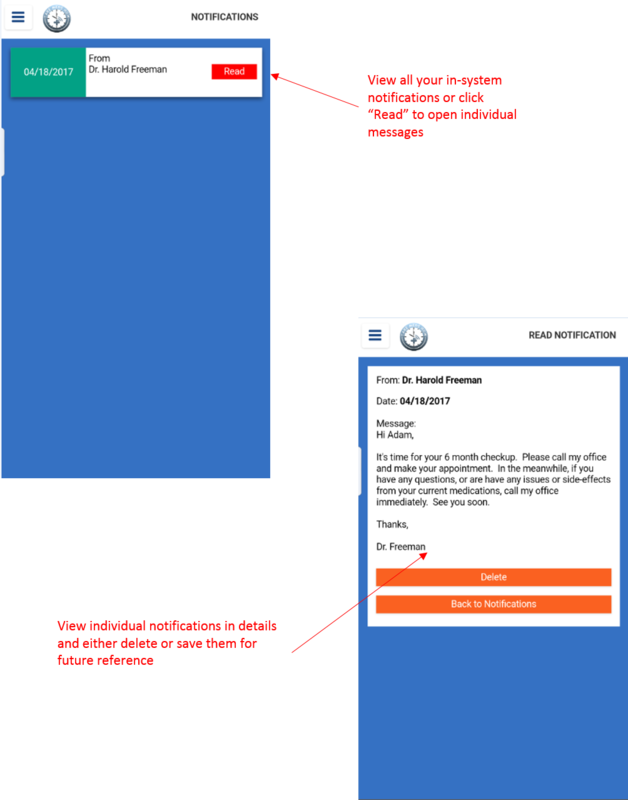 If they already have a Take Meds Now account, they will receive an email and in-system notification to alert them to your invitation. If they do not have a Take Meds Now account, we will send them an email to invite them to join and link to your account – as well as the many benefits of doing so. You have complete control over your Take Meds Now account, including the types of alerts you and those linked to your account receive, and to what devices you receive those alerts. 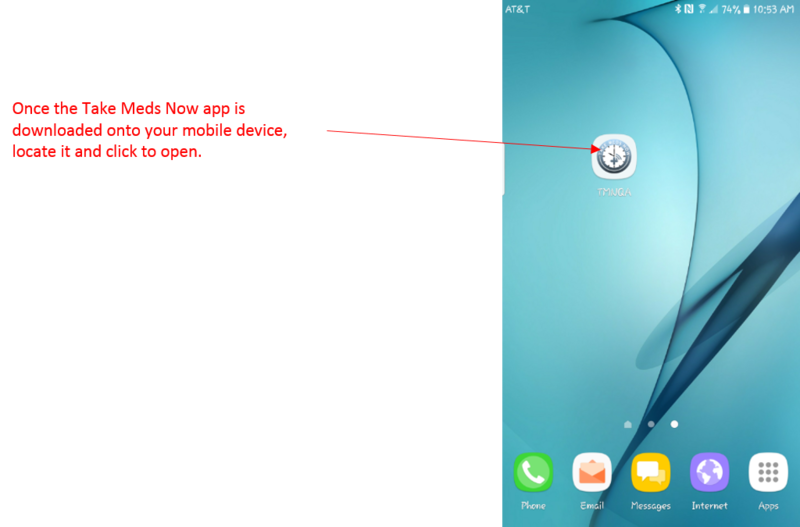 Just navigate to the Settings page, and you will be able to modify settings such as to the types of alerts you receive, number of follow up alerts you receive, the type of verification buttons you see throughout the application alerts you receive, and the type of verification buttons.